In June of 1961, A. E. Hotchner visited an old friend in the psychiatric ward of St. Mary's Hospital. It would be the last time they spoke: a few weeks later, Ernest Hemingway was released home, where he took his own life. Their final conversation was also the final installment in a story whose telling Hemingway had spread over nearly a decade. 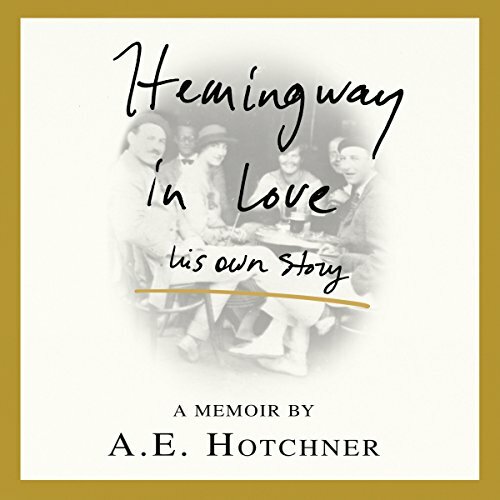 In characteristically pragmatic terms, Hemingway divulged to Hotchner the details of the affair that destroyed his first marriage: the truth of his romantic life in Paris and how he lost Hadley, the real part of each literary woman he'd later create and the great love he spent the rest of his life seeking. And he told of the mischief that made him a legend: of impotence cured in a house of God; of a plane crash in the African bush, from which he stumbled with a bunch of bananas and a bottle of gin in hand; of F. Scott Fitzgerald dispensing romantic advice; of midnight champagne with Josephine Baker; of adventure, human error, and life after lost love. This is Hemingway as few have known him: humble, thoughtful, and full of regret. To protect the feelings of Ernest's wife, Mary - also a close friend - Hotch kept the conversations to himself for decades. Now he tells the story as Hemingway told it to him. Hemingway in Love puts you in the room with the master as he remembers the definitive years that set the course for the rest of his life and dogged him until the end of his days. This is a beautifully told story by Hotchner. The notes he kept are not cold pressed, but reveal an author with torn love and regret and an open friendship. This makes a wonderful companion to A Moveable Feast, which has been updated in recent years with additional writing on Hemingway's first love that goes along with the last few chapters in this memoir and speaks movingly to loss, love, and regret. I really enjoyed this entire audio book! This was a very enticing story and very well narrated! It's nice to know that even a legend is susceptible to the scourge of love. Well told and constructed, I was fully engaged until the end. This is absolutely a must read/listen for any Hemingway fan. Wonderful insight into Hemingway's art, mind and heart. 50 years ago as a senior in college I read Papa Hemingway at the advice of a friend. Many times over my life since then, I’ve reflected on what I got out of that book. This book helps complete my understanding of this complicated human being. I go through many moments in awe of Hemingway then I get angry at his writing. His life was still something amazing even if he was the protagonist in most of his misery. I really enjoyed getting this perspective on his life. Life is more about who you know and this shows some of those relationships for him. I spent the last week in Key West. After touring the house and catching a couple meals (and a few drinks) at Sloppy Joes, this was the perfect story for our trip home.